Tessa: I had a dream about a cow. Me: What did the cow do? Tessa: It said Moo. And walked across the park. Posted in Dreams and tagged cow, dream, moo, park, walk. Bookmark the permalink. 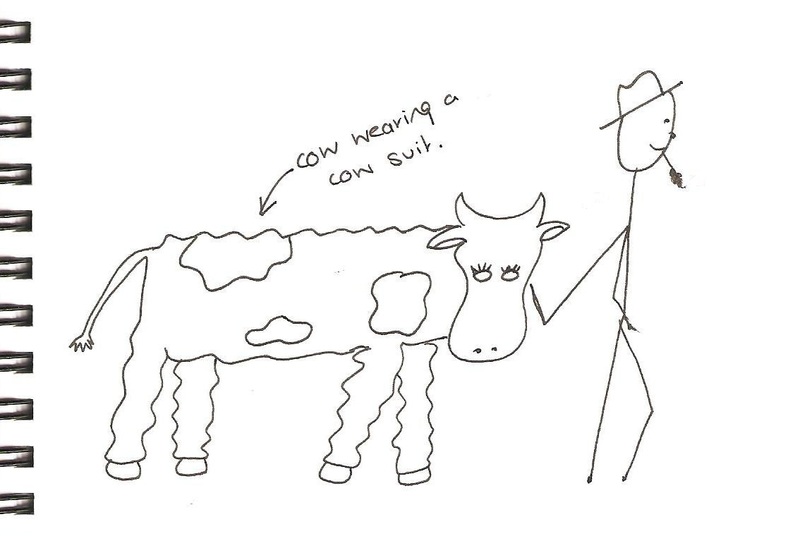 I’m afraid I don’t have much of a context for this – I just saw this farmer walking along with what looked like two people in a cow suit – you know the kind that is worn in pantomimes, or Top Secret!, but then realised that it was a cow in the cow suit, not two people. Posted in Uncategorized and tagged cow, cow suit, dream, farmer. Bookmark the permalink.